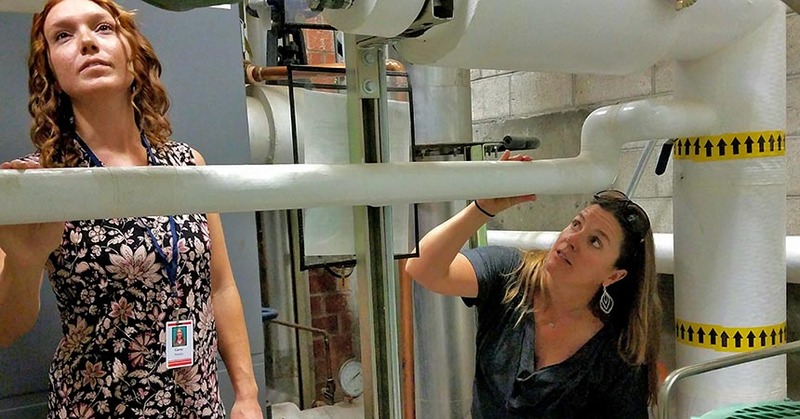 Commercial SEM intern Cacey Thomas and sustainability coordinator Jackie Wilson observing the equipment in the boiler room at Bear Creek Elementary School in Bend. Through Energy Trust of Oregon’s Commercial Strategic Energy Management (SEM), businesses and organizations gain the tools and experience to manage energy in their facilities and save energy over time. Commercial SEM participants can also receive incentives to hire interns who are interested in careers in energy management. These interns can use what they learn in the classroom to help their sponsoring organization reach SEM goals. Portland Community College (PCC) hired intern Zachariah Strife, who is dual-enrolled at OSU and Mt. Hood Community College, studies environmental sciences. Since beginning the Commercial SEM internship at PCC in May 2018, he has helped with planning new energy efficiency projects, monitoring and analyzing building energy use, planning staff engagement activities, designing marketing materials, and leading and representing PCC on energy teams. 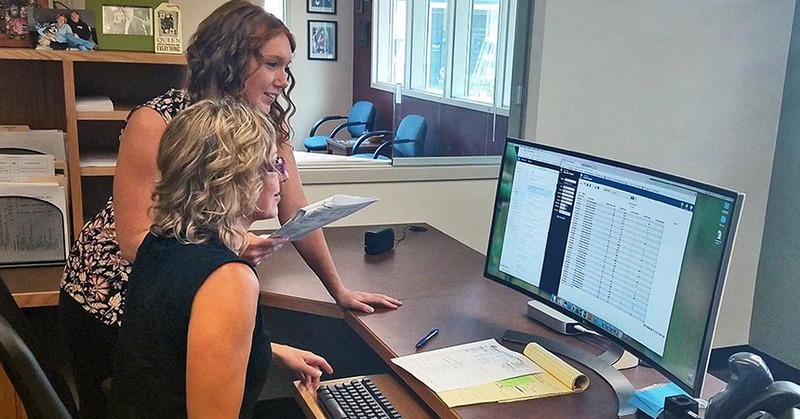 Commercial SEM intern Cacey Thomas and facilities support supervisor Anne Birky working on the energy management database for Bend-La Pine School District. Thomas conducts daily school walkthroughs to check that all lights and HVAC equipment are shut down, enters data to set an energy savings baseline and tracks energy use to analyze costs. For the summer shutdown, she ensured all equipment in the school district’s 38 facilities, from refrigerators to computers, was turned off. She plans to take what she has learned in SEM and create lesson plans to speak to high school students about how they can reduce energy use. “I now know how engaging people can have a positive impact on utility bills,” says Thomas. In 2017 OHSU West Campus welcomed intern Michelle Dawson, a student of Portland State University studying engineering. Laura Jane Schaefer, Sustainability Manager for the West Campus, worked with Dawson to conduct an air flow assessment of six buildings on the campus, with a goal to rebalance each building based on modern design standards and current equipment loads in the building. A whole building rebalance had not been done since the buildings were constructed in 1962. Based on Michelle’s findings, OHSU West Campus plans to evaluate proposals to rebalance the buildings, with an estimated savings per building ranging from $300-30,000. Russ Williams, Linn County director of general services and property management, reports their intern, Bridger Cook, has “really helped us be more successful with SEM.” Cook is majoring in energy systems engineering at OSU, with his sights set on designing efficient wind turbines or solar panels when he enters the workforce.